1. Combine the peaches, ½ cup of sugar and the lemon juice in a bowl. 2.Cover and refrigerate for 2 hours, stirring the mixture every 30 minutes. 3. Remove the peaches from the refrigerator and drain the juice into another bowl. Return the peaches to the refrigerator. 4. Whisk the eggs in a mixing bowl until light and fluffy, 1 to 2 minutes. 5. Whisk in the remaining ¾ cup sugar, a little at a time, then continue whisking until completely blended, about 1 minute. 6. Pour in the cream and milk, and whisk to blend. 7. Add the peach juice and blend. 8. 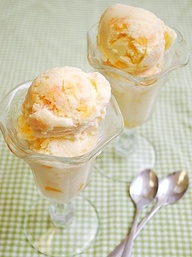 Transfer the mixture to an ice cream maker and freeze following the manufacturer’s instructions.